More than a thousand times people have written about the human rights issues in the Gambia since Yahya Jammeh illegally seized power in July 1994 and often than not so many people in and out of the Gambia have ignored the pleas. The issue is getting out of hand in the minute just as the Monday 26 October 2015 Foroyaa newspaper’s headline indicates “Detention Without Trial, Disappearance Without Trace Continues Unabated in The Gambia” and these are things that were alien in the Gambia before 1994 and two examples which shocked and still fresh and vivid in the memory of many Gambians are the brutal murder of Koro Ousman Ceesay the former Finance Minister of the then AFPRC government and the brutal murder and maiming of students on the 10th and 11th April 2000. People are being arrested on a daily basis and yet nobody has the will to talk about it and that is why Foroyaa Newspaper has to be commended for their boldness and as usual when it matters to bring such issues to light. In July this year, Yahya Jammeh announced the pardoning of some prisoners and some of us had reservations that, it is not out of goodwill Jammeh had to do this and time has proved us right. From July to now the human rights violations and impunity have continued which resulted in the arrest and detention of more 21 people without trial and some of them, their family members still don’t know their whereabouts. Such people include Mr. Buba Ceesay, Mr. Sheikh Omar Colley, Imam Alhaji Ousman Sawaneh, Mr. Ousman Jammeh, Mr Seedy Jaiteh the list is inexhaustible. The suffering and trauma that those families faces are ongoing on a daily basis while Jammeh and his lieutenants continue to live their normal lives and yet he he calling for change, what a hypocrite Jammeh? If Jammeh was serious about his so called presidential pardoning the likes of Amadou Sanneh should have been free by now, but that was all part of his strategy to relieve some of pressure off him that is why he let go some prisoners and still detained some. 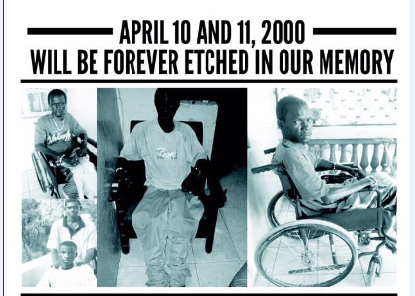 Meanwhile, talking about the 10/11 April student victims, it’s fifteen years and counting yet Jammeh is still not bold enough to repeal the controversial indemnity act that prevents the killers of the students from prosecution, yet Jammeh thinks people will take him seriously, no way Mr Jammeh! 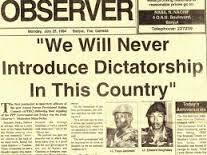 However, the recent trial of the former Chadian president Hissene Habre in Senegal and the exhumation of the remains of the former president of Bukina Faso, Thomas Sankara are all encouraging signs and warning to Jammeh that no matter how long it takes Justice Must Be Served one day!